They fight blazes near their own homes regularly, but when called upon, firefighters are always willing to lend a hand, an axe or a hose to departments that need help when disaster strikes. “Sometimes it can be like a long camping trip,” said Kareena Tulloch from Klamath National Forest. 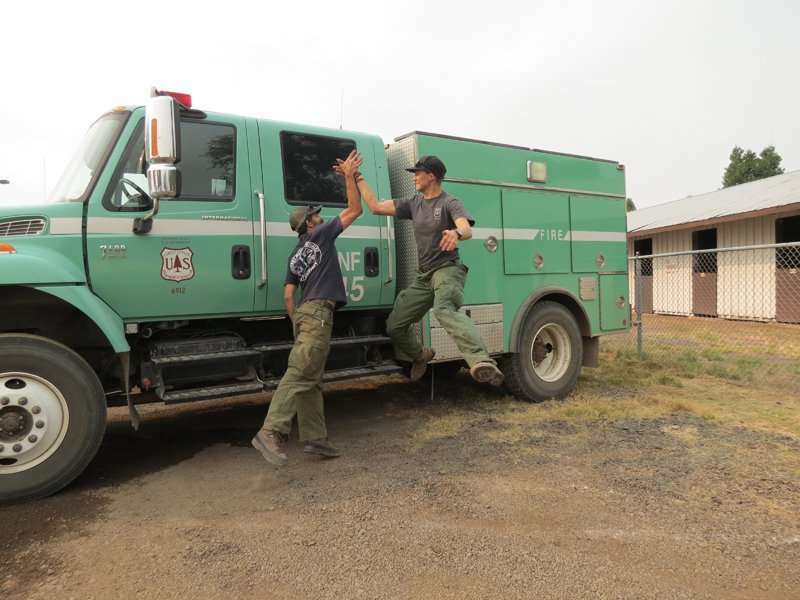 She, along with her crew on a type 3 engine, set up camp at the Lassen County Fairgrounds for the recent Whaleback Fire at Eagle Lake that threatened the town of Spalding and grew to about 18,703 acres before full containment last week. Working for a national organization, the United States Forest Service, Tulloch can be sent anywhere in the country to fight blazes. For every 14 days on, she gets two days off, a schedule that can be tricky, but rewarding as well, she said. For the Whaleback Fire, more than 800 personnel from 15 different states — Alaska, Arizona, Colorado, Idaho, Mississippi, New Mexico, Nevada, Oklahoma, Oregon, South Carolina, Tennessee, Texas, Utah, Wisconsin and Wyoming — traveled to rural Lassen County and offered assistance to tackle the blaze that forced evacuations and road closures. Although it came close, no structures were burned in the fire — something Tulloch is proud she could help with. After coming back to camp in the morning after a night of fighting the fire, Tulloch, still full of energy, begins to wind down. Her regular schedule, she said, is 16-hours on, 8-hours off. “You’re supposed to be sleeping for those 8-hours,” she laughed, adding that doesn’t always happen. However, she noted she’s not too picky when it comes to her camping spot. “If you work hard enough, it doesn’t matter where they put you to sleep. You’ll sleep,” she said. She told of one of the earlier nights on the fire where her crew pulled a 24-hour shift, “that feeling of actually being productive and helping,” keeps her going in the field. For the most part, Tulloch worked 16-hour night shifts with her crew on the Klamath National Forest — Salmon River District type 3 engine. As a part of the Wildland Firefighter Apprenticeship Program, she gets to do a bit of everything for training — digging line, laying hose, structure protections and mopping up the fire. Although there can be two-weeks at a time before Tulloch gets to return to her Scotts Valley home, the people and the new places she get to see makes it worth it. “I really like the crew and the people you get to work with; the camaraderie,” said Tulloch, adding she’s gotten to see so many more places she never would’ve gotten to visit before. She also said the communities she has gone to have been so welcoming and thankful, it helps to make her job easier. From the Spalding Volunteer Fire Department supplying food and coffee for the crews to the multitude of signs residents put up at the Lassen County Fairgrounds, it’s the little things that help keep firefighters motivated during their tiring days. Doreen Gatewood, who works in the fire information department of the U.S. Forest Service, traveled from her home in Arizona to assist in informing the public on the local Whaleback Fire. At first she was dispatched to the San Bernadino Fire. As she arrived that blaze was nearing its end and she was automatically reassigned to the fire at Eagle Lake, prompting her drive up the length of the state. “It can be difficult because you never know what to expect, there’s a lot of different circumstances,” Gatewood added. She added large fires, especially those that threaten homes, take the cooperation of various departments. “No one agency can do it alone,” she said. Some fires are unpredictably difficult, though, and they ravage towns, kill personnel and civilians and destroy livelihoods. And sometimes, firefighters don’t even get to fight the fires in their own counties as they’re assigned to tackle other blazes. Chris Baker, the fire instructor at Lassen Community College and the volunteer advocate for Region IX of Everyone Goes Home, a firefighter life safety initiative program, said traveling to fight campaign fires, ones that seemingly go on forever and are difficult to contain, often takes a toll on crews. He added once crews get to take a break, there is a period of readjustment. They get off the line, and after being in a situation where they are in the middle of some crazy fire activity, especially as seen in the Carr Fire near Redding, it’s a while until they can let go of that. 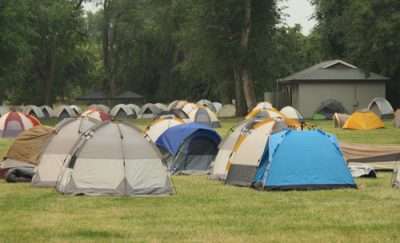 Many tents cover the ground at the fairgrounds as the Forest Service sets up camps to battle the Whaleback Fire. Baker explained a situation where Redding firefighters were assigned to cover a different fire while the Carr Fire was burning their homes. He said three firefighters lost their homes, but when they’re on the line tackling a different blaze, they can’t think about it. They can’t stop for a moment and grieve; they must continue their work. “You can’t get emotional, you can’t cry … literally, these guys and gals that are out there are literally beyond their limits emotionally, mentally, spiritually, physically,” Baker added. They work hard, he added, ensuring they don’t get distracted from the task at hand, despite the exhaustion. Although fire personnel are instructed on what to expect, and they have an out-of-town-bag, which consists of what ever they want in the bag for their extended service fighting fires, it still can take its toll. 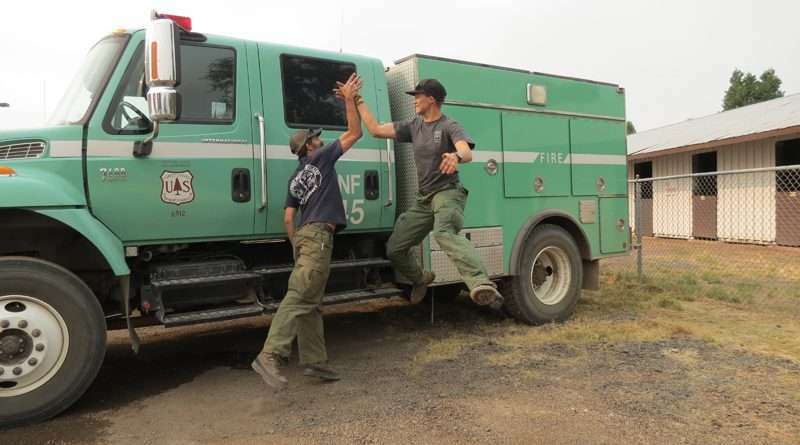 Last week, according to Cal Fire Public Information Officer Leah Sandberg, 49 local Cal Fire personnel were fighting the Carr Fire with an additional 21 fighting other blazes throughout the state. “The sacrifices they make are great. Not only are they working in hot, dirty, physically demanding and dangerous conditions, they are away from their families. All of the things they helped with at home have to be done by the ones left behind. It’s hard on the firefighters and their loved ones,” said Sandberg. They join crews from other local agencies who have sent personnel to protect people and homes in other fires. However, when a community comes together and shows their support for the crews risking their lives on the line, protecting lives, property and the environment in different areas, it helps, said Baker. Although some crews are unable to except generous offers the community freely gives, they can always receive thank you notes, signs and other forms of appreciation. Fire season is a time when fire crews often don’t know when they’ll be home. In the past, crews would just work the hottest months, but the “new normal,” according to Baker, has crews ready to go at all times. But their dedication is certainly recognized. “Thanks to all who are here away from home saving our county from destruction, you are awesome,” wrote one Facebook user. “Real life heroes! Thank you for protecting us,” wrote another. No amount of words can express my love and admiration and respect for these folks that give of their ALL not just during Fire season to keep community and structures safe and tackle what is needed in emergent situations! YOU ARE AWESOME!